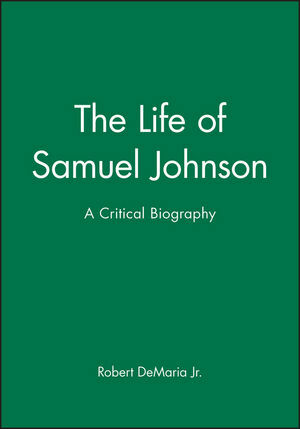 In this major revision of The Life of Samuel Johnson, Robert DeMaria makes a compelling claim for the attention of a new generation of Johnson's readers and admirers. Robert DeMaria is Henry Noble MacCracken Professor of English at Vassar College, where he teaches Old English and the History of English as well as Eighteenth-century British Literature. In 1986 he published Johnson's Dictionary and the Language of Learning His British Literature 1640-1789: An Anthology in the Blackwell Anthologies series is forthcoming. A Note on the Form of Citation. 9. The Vanity of Human Wishes. 17. Lectures on the English Law. 19. A Jourey to the Western Islands of Scotland. 20. The Lives of the Poets. * An important revisionary account of Samuel Johnson. * Integrates the most recent scholarship. * Provides a closer examination of Johnson than any previous study.